Besides the attacking football and terrific atmospheres in the Bundesliga, one of the best parts of watching the German top flight is all of the young talent on display every matchday. Prodigies like Ousmane Dembele, Timo Werner, Christian Pulisic, Joshua Kimmich and Leon Goretzka are some of the many young stars that feature in the German top flight, but for every young hotshot in the Bundesliga, there are also some who don’t get a chance to play. 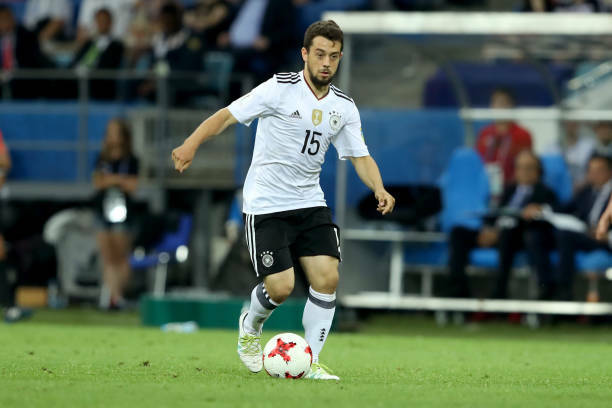 One of the youngsters who fell in the latter category was Amin Younes, who was sold by Borussia Monchengladbach to Ajax after struggling for game time at a young age, and he eventually found his form and became a German international. At the ripe age of 8 years old is when Younes joined Monchengladbach and by 2011 he was playing for the reserve team, which completed his rapid rise through the Gladbach academy. Younes also featured for the Germany under 16, 17 and 18 sides before making his debut for the Gladbach reserve side. After featuring for the reserve side for most of 2011-12 season, Younes was awarded with his Gladbach debut in April of 2012 at the age of 17. At this point in his career, Younes was one of Gladbach’s top prospects, who many tipped for a big future with the club. The following season, Younes was given much more of a chance to play as the German made 6 starts and 11 appearances in the Bundesliga during the 2012-13 season. But, Younes failed to impress during his 530 minutes on the pitch, as he scored just one goal and didn’t provide an assist. This mediocre form was just the beginning of his struggles, as the following season, Younes only played 199 minutes in the Bundesliga while making 14 appearances off the bench for Gladbach. The German registered only 2 assists and he didn’t score during his limited minutes. When he was on the pitch, he wasn’t improving at the level that most young players would at his age. Clearly, based on his lack of production on the pitch, Younes wasn’t quite ready for the Bundesliga during his teenage years. Based on how infrequently he was used by Gladbach, they didn’t think Younes was quite ready yet either, which is why they ended up loaning him out to 1.FC Kaiserslautern in the 2.Bundesliga. This loan was supposed to be a stepping stone for Younes, as the Foals thought he would be able to play a lot of games and regain his form against lesser competition. For a player with the amount of talent that Younes has, the 2.Bundesliga was supposed to be a league that he could excel in. Unfortunately for Younes, this is not what occurred with Kaiserslautern, and he only ended up making 14 league appearances, scoring twice while he certainly hit the low point of his young career. For any teenager, struggling in the Bundesliga is understandable and something that most star players have to overcome, but after multiple seasons of mediocre form, it looked like Younes hit a wall in his development. After his short time in the second tier, Gladbach deemed him not good enough despite his young age and he ended up in Ajax. With Ajax’s ability to develop young talent, Younes needed to show improvement with the Dutch side in order to revitalize his career. But before he even began his career in Amsterdam, the downward spiral that Younes was going through came to a screeching halt. This is because the winger finally found his form in the 2015 under 21 Euros, where he played in 4 games for Germany, registering an assist. In a similar manner to Serge Gnabry at the Olympics, being able to play on the international stage while getting away from the pressures of club football revived Younes and his form. In those games, the German also averaged 1.8 key passes and 3.5 successful dribbles per game, and his ability to pass and dribble at a much improved rate allowed Younes to thrive while playing for the under 21 side. Soon after the uplifting summer of 2015, Younes joined Ajax and embarked on his first season with the club. Since he was bought for a meager fee of 2.5 million euros, he didn’t face the pressure that most new players face. Along with playing in the Eredivisie, being able to be surrounded by young talent instead of being one of the youngest players on the team certainly helped Younes at his new club. All of these factors allowed him to thrive right away in Amsterdam, as Younes became an important part of the Ajax team in his inaugural season. The German registered 8 goals and 5 assists in 25 games in the Eredivisie for Ajax, and he averaged 1.7 shots per game and 2.6 dribbles per game as well. Even when Younes wasn’t scoring or racking up assists, he was dribbling past defenders and getting involved in the possession oriented buildup of Frank de Boer’s Ajax. While Younes thrived from the first whistle for Ajax in the domestic competition, he still wasn’t at his best during the Europa League games in 2015-16. In the 6 games he featured in—three of which he started—Younes didn’t score or register an assist. Even though he had certainly shown improvement, it was up to the tricky winger to display his talent on a more grand stage to finally start getting recognition. While Younes certainly needed to improve his Europa League showings, his domestic performances actually got off to a slow start this past season. The German struggled mightily in the final third, which is why it took him until February to score his first league goal this season despite averaging 3.4 successful dribbles per game. He also averaged over 2 shots on target per game, which means that he was getting chances in front of goal even if he wasn’t finishing them. Misses like this are why it took him over half of the season to score. Younes eventually picked up his domestic form and ended up with 3 goals and 6 assists, but his Europa League form was terrific from the start. He scored 2 goals in the group stage in the two legs against Celta Vigo, while he averaged an astonishing 5.1 dribbles per game across 15 matches in the competition. Younes was excellent in the semi final win against Lyon, as he scored the third goal and dominated with his ability to create chances. His performance on the big stage in Europe allowed the football world to see how much the former Gladbach youngster had developed in Amsterdam. In fact, his play was so impressive that Joachim Loew rewarded him with a call up to the national team. After barely getting a game in the second tier a few years earlier, the winger had become one of the few to represent the world champions. 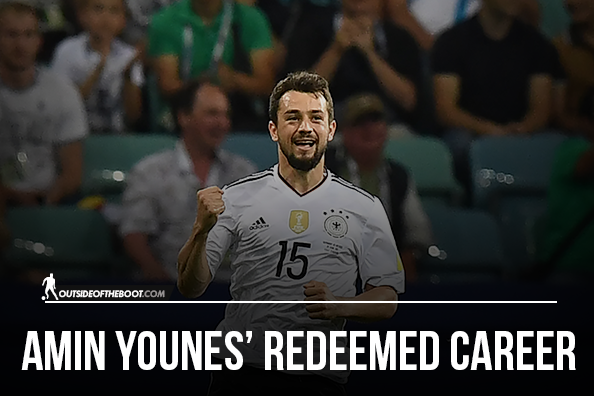 But the triumphant story of Amin Younes doesn’t stop with the call up to Die Mannschaft, as Younes scored one of the many goals in a 7-0 win against San Marino. He would then become one of the many fresh faces that would help Germany win the Confederations Cup in style over international powerhouses Chile and Portugal. The winger played his part, with a goal against Mexico in the semifinals that justified the call up to the team that he received. Now that Younes has become a star for Ajax and become a German international, a host of clubs are interested in buying him this summer. The list includes the likes of Schalke and Fiorentina, who would certainly allow Younes to shine in European games once again, and as long as Younes keeps improving at the rate that he has, more Germany caps are certainly in his future. Not bad for a player who couldn’t get three goals for Kaiserslautern.